Recently I bought a new pair of megane as my previous pair was getting old with lots of scratches on the lens. Decided to go for a more fashionable type with the black plastic half frame. The old pair was silver metallic full frame. dannychoo.com members may check out this post to enlist in the megane club. Since I was 11, primary 5. Dammit. I also prefer half-frames nowadays. I should really be wearing contacts. Same. 6th grade myopia. Have tried contact lenses but disliked them; inadvertently have gotten used to the minimal protection afforded by glasses. When I was about 7 I actually wanted glasses. Never have had a need for em though. My mother has worn contacts for most of her life and my little bro has had glasses since he was like 4. And LOL at the Clannad comment on my blog. Em my eyes still in good condition, hopefully nothing bad happened to it. been wearing one since primary 3, around 9 years old. I have been wearing specs my entire life. I probably already wore them the moment I was born. Have wore megane ever since I was in Kindergarten 2 (6 years old). I’ve been wearing glasses since the beginning of grade 6, so that’d be around seven years. Where’d you get the small glasses for the figmas? They are the perfect size! I wear my glasses if I need to to see details such as the whiteboard. But otherwise I don’t need them. Heck, I forgot my glasses during the vision screening for my driver’s permit and still passed. Ive been wearing glasses since 5th or 6th grade. I scratch mine new 1 week later and it is transition…. I dont use glasses, but all my friends do!! I tend to think all people who uses lenses have an intellectual look..
thanks for all the comments. seems like many of us got myopia at early growing up years. u are coming back soon? great. welcome back. remember to eat more. 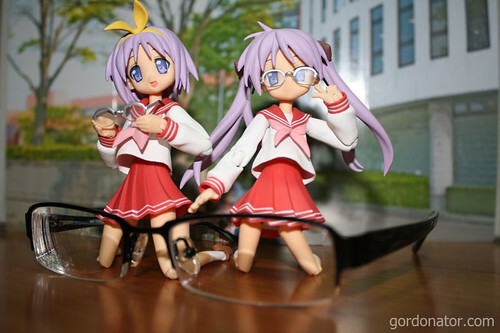 the mini megane are from max factory’s yuki nagato figure. astigmatism? meaning, blurness when viewing from certain angles? Actually, I do wear glasses for nightime driving. I usually just leave them on as things are basically clearer with them. I used to have half-frame too, but after dropping it accidently and broke the glass quite bit before a shower prompt me to get something a little more secure -_-. I never used one, and hoping I won’t use one. but isn’t it common for objects far away to be blurry? wear them for range as well? old school black frame is fashionable now. congrats on getting new found perfect eyesight. hope there’s no side effects. finding a place to put my glasses during shower is always a problem for me too. do take good care of them.